The castle takes its name from the Norman invader Roger Montgomery whose motte and bailey castle ‘Hen domen’ was superseded by Montgomery castle. Situated on a steep ridge a timber castle was built here by Henry III in 1223, by 1233 it had been replaced with a stone building. The castle’s position on a narrow ridge meant that the castle was built to a design of five successive wards. 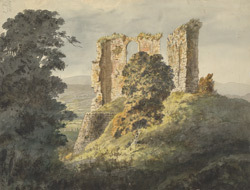 The castle declined in Importance and was a ruin by the 14th century, although it was refurbished in 1538 by Bishop Rowland Lee during the Civil War the castle was seized by Parliamentarian troops and in 1649 it was demolished.